Huntington University (HU) is a private Christian liberal arts institution headquartered in Indiana, with a new branch campus in Peoria, Arizona. The opening of the Huntington University Arizona Center for Digital Media Arts (HUAZ) was a dream four years in the making. The Arizona location offers quality four-year BA and BS degrees in the STEM technology fields of media, animation and design. HUAZ is housed in the former Dolce Salon and Spa, a 29,222 square-foot building in the city’s entertainment and dining district. The facility at 8353 W. Mariners Way met all the requirements of the university including the bonus of being located next to a Harkins’ Theatre, a venue the students campus will be aspiring to create media for. The building is also right across the street from the San Diego and Seattle spring training fields, where students can do outdoor shooting. Student Richard Sawyers first visited the new HUAZ campus last summer when the building still had velvet-patterned wallpaper from the spa, but he trusted the administrator’s vision to offer well-rounded programs in digital media arts. “I bought into what their vision was,” said Sawyers, 29, who is majoring in animation. “There is a big calling for animators and filmmakers in Arizona, but there are not a lot of schools on the west side of Arizona.” Sawyers enrolled to support a new university in his community that could help him, and others, build a career. Last spring, HUAZ partnered with Peoria’s Theater Works to design video projections for a Theater Works play, “Sunday in the Park with George.” Student Josiah Duka, who’s majoring in graphic design, participated in that project and said he values those real-world experiences. Majors include animation, broadcast media, graphic design, and film production, which is the largest program at HUAZ. The college is rolling out courses in a sequence and will add staff as enrollment figures grow and there is enough student interest. A degree related to web development might be offered in the future. For now, though, the university chose to focus on a handful of digital media arts programs to attract a niche of students who don’t have many options locally. HUAZ sees its competitive edge as offering degrees that aren’t widely available in Arizona. “Offering several integrated digital media bachelor degree programs under one roof is one unique aspect of Huntington’s approach to higher education. For example, students can major in one area such as film and easily expand their skills by taking elective courses in graphic design,” said Jeff Berggren, Huntington’s director of Arizona operations. Upon completion of their degrees, some of the career choices available to students will be motion picture production, editing, audio/studio recording, podcasting, broadcast journalism, sports broadcasting, commercial graphic artist, or media specialist. HUAZ leases space to Cineforge Media, a local film-production company. Jeremy Tremp, co-founder of Cineforge Media, said the location inside the university campus gives him the opportunity to collaborate with students and mentor the next generation of film producers. Some students also interned with Major League Baseball during spring training at the nearby Peoria Sports Complex, and a film editing class produced short promotional videos for ten local non-profit organizations. Huntington’s Peoria campus has two high-end computer classroom/labs; a studio with a green screen; another studio with a set, high-definition cameras, and state-of-the-art TV control room for broadcasting and film productions; Foley pit; a host of HD, EFP and cinema cameras; an equipment room dubbed “the Cage,” with $250,000 in production equipment that students can check out for projects; lighting gear for student production work; an audio-recording room and mixing panel; several private edit suites, and a 50-seat screening room. The campus also has a dedicated fiber optic wire that connects the Peoria location to the main campus in Indiana, which allows students to access library archives and broadcast live video between locations. As an extension of Huntington University in Indiana, HUAZ follows the same motto: “Christ. Scholarship. Service.” A university-wide approach to spiritual growth features integration of faith within the classroom and small group interaction outside of class. While the programs at Huntington University are designed especially for students who desire to study in a Christian environment, the university welcomes students of all faiths who understand the objectives of the university and are willing to abide by its social standards and policies as outlined in the student handbook. HUAZ started out with 25 students enrolled last year at this time, and has been adding about 50 students each semester since then. Associate Dean of Arts Lance Clark said the goal is for enrollment to reach 350 to 400 students in the next two to four years. Huntington University welcomes students from geographically and experientially diverse backgrounds. 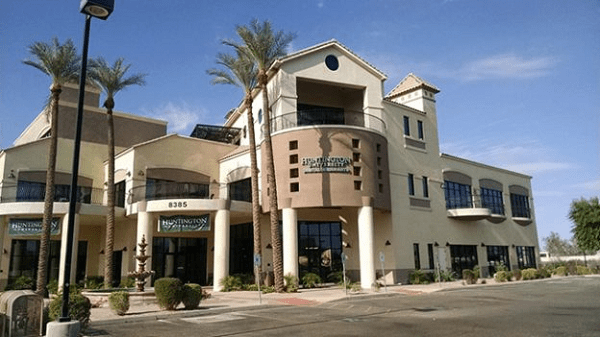 The Peoria location accepts first-time Freshman students, transfer students, high school early entry students, international students, and non-degree-seeking students. At $380 per credit hour, tuition and fees for full-time in-state and out-of state students at HUAZ is about $12,500 per year. In comparison, Arizona State University’s tuition and fees for in-state students is $10,792 and for out-of-state students it’s $27,372. Students are eligible for all forms of federal aid, including grant and loan programs. Huntington University welcomes homeschoolers and invites them to apply along with public and private school students. The admissions staff will need a copy of your high school transcripts, your official SAT/ACT scores, and a completed application. Your application essay is especially important. Huntington University doesn’t conduct admission interviews, so this portion of the application, along with the required supporting materials, is the best way for them to evaluate your candidacy for admission. They look for well-rounded students who are also involved in non-academic activities such as church, youth groups, community service, drama, and sports leagues outside of high school. Huntington University has a “strong historic and ongoing relationship with the Church of the United Brethren in Christ,” an evangelical denomination headquartered in Huntington, Indiana. The university is a member of the Council for Christian Colleges and Universities (CCCU). The institution opened as “Central College” in 1897. The name changed to “Huntington College” in 1917. Huntington gained accreditation from the North Central Association of Colleges and Schools in 1961, and the institution achieved university status in 2005. The main campus is a comprehensive Christian college of the liberal arts offering graduate and undergraduate programs in more than 70 academic concentrations, including thriving programs in digital media arts, agriculture, exercise science, ministry and social work. U.S. News & World Report ranks Huntington among the best colleges in the Midwest, Forbes listed the university as one of America’s Best Colleges, and Princeton Review named the institution on its “Best in the Midwest” list. To learn more about HUAZ and its digital media arts program, visit huntington.edu/peoria.